Contact us via the form below to find out more about Metropsis, and to obtain pricing and purchasing information. 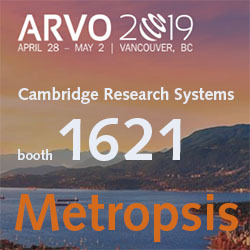 Our Staff Scientists, Dr Caterina (Katia) Ripamonti, and Dr Rob Lee will be at ARVO this year, demonstrating Metropsis. You can drop by booth 1621 anytime during exhibition hours, make an appointment, or send us a message using the form below. Enter your best day to meet during ARVO 2019 (if applicable) Enter your best day to meet during ARVO 2019 (if applicable)Sunday April 28th AMSunday April 28th PMMonday April 29th AMMonday April 29th PMTuesday April 30th AMTuesday April 30th PMWednesday May 1st AMWednesday May 1st PMJust contact me to arrange it. Katia joined Cambridge Research Systems from University College London, Institute of Ophthalmology, where she retains an Honorary Senior Research Fellowship. She is also an Honorary Research Fellow at Moorfields Eye Hospital. Katia is the author of various papers on human colour vision, spatial and temporal properties of normal and defective vision, and applied aspects of colour science related to human factors, as well as the co-author of the book Computational Colour Science using MATLAB. Metropsis is brought to you by Cambridge Research Systems Limited.